A-B-Cs are as easy as 1-2-3, except when you're staring at your election ballot trying to make sense of the letters and numbers. KUSA — A-B-Cs are as easy as 1-2-3, except when you're staring at your election ballot trying to make sense of the letters and numbers. Why are certain ballot measures called "Amendments" and others called "Propositions?" Why do some have numbers and others have letters? "An amendment amends the Colorado constitution. (A) proposition will change the statutes," said Colorado Deputy Secretary of State Suzanne Staiert. "The legislature can't change an amendment. An amendment can only be changed by the people. The legislature, as times change, can change the language that's done in a proposition." Consider amendments more set in stone and difficult to change. Constitutional amendments now require 55 percent of the vote to pass, a change voters approved in 2016 when they approved Amendment 71. Propositions are changes to state statutes that can be modified by state lawmakers. Propositions need 50 percent plus one vote to pass. You may also remember hearing the word "initiative" before the ballot was set. 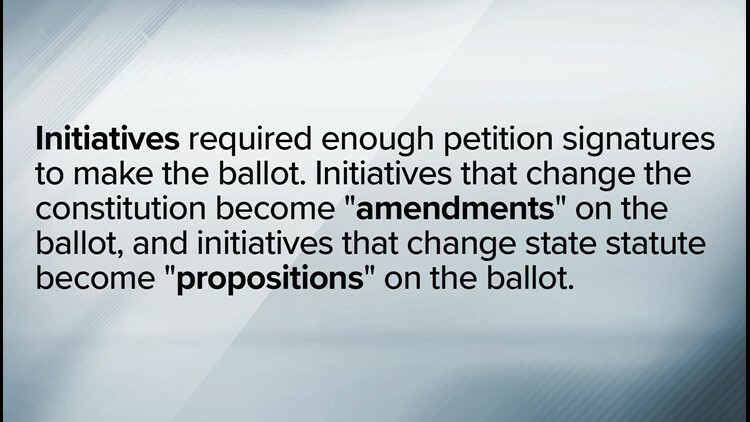 Amendments and propositions were known as initiatives before they qualified for the ballot. "The initiatives are ones that we have seen gathered at the grocery stores all summer. Those are questions that are put on by proponents of a certain idea," said Staiert. Initiatives required enough petition signatures to make the ballot. Initiatives that change the constitution become "amendments" on the ballot, and initiatives that change state statute become "propositions" on the ballot. The letter or number of the ballot issue tells you if it made the ballot because state lawmakers referred it to voters, or if citizens got it qualified for the ballot. Constitutional amendments that are referred to us by lawmakers require two-thirds vote of the legislature to make the ballot in the first place. If they do, they are given a letter, such as "Amendment Y." Propositions that are referred to us by lawmakers require a majority vote of the legislature and are given a double letter, such as "Proposition AA," but we don't have any of those in 2018. Constitutional amendments that qualify for the ballot from citizen-initiated efforts are given a number between one and 99. Propositions that qualify for the ballot from citizen-initiated efforts are given a number between 100 and 199. Legislation passed in 2009, which took effect the following year, designated the starting number and letter for amendments and propositions. Starting in 2010, amendments referred to us by the legislature started with the letter "P." Amendments that qualify from citizen-initiated efforts started with the number "60." Propositions that qualify from citizen-initiated efforts started with the number "100." "This year, from the referred measures from the legislature, we start on V, then we have W, X, Y, Z and it comes around to A," said Staiert. On your ballot, you will see Amendment Z followed by Amendment A. That's not a typo. Amendment Z qualified for the ballot first, followed by Amendment A, which comes last because the alphabet resets. Numbers could go on forever, so why don't they? "The yard signs would get so long," said Staiert. "We would eventually have initiative 8,912 and nobody would remember it. It's not catchy. 'Vote yes on 8,912.' It just doesn't work." City and county issues on your ballot are numbered and lettered differently.